As part of its environmental certification obligations, PF Olsen periodically surveys the contractor workforce. This provides information which can be used to manage any issues raised and assists with the objective of an involved, motivated and safe workforce. PF Olsen’s Environment Manager Kit Richards says the survey covers nine areas of focus including safety, training, confidence in the industry, financial adequacy, work-life balance and environmental matters. The survey was completed by 306 respondents in the second half of 2015. A similar survey was carried out in 2012 which provides the opportunity for comparisons and possible trends to appear. Safety: A greater recognition of the harm suffered from work related accidents and an increase to 93% of respondents stating they felt comfortable refusing to do unsafe work (an improvement of 5%). The fact that some still feel uncomfortable shows there is more to be done in creating a culture empowering workers to speak up. As in 2012, the greatest contributor to dangerous situations was poor weather conditions along with machine interactions, difficult terrains and tree falling. Respondents also revealed a greater number finding training very useful or a bit useful totalling 96% compared with 82% in 2012. This may suggest that an increased focus on training and training content is starting to pay dividends. As in 2012, respondents generally had a great deal of pride in the work they did (91%) and most enjoyed their work most of the time. Despite this, at the time of the survey in 2015, log markets were well down and contractors and their staff were not feeling as confident as they were in 2012. Aspects of work life balance revealed just over 60% of workers were doing 40 hours or less a week (including travel) and 91% less than 60 hours (including travel). The balance working 60 hours or more has potential implications on safety due to risk of fatigue. Of the total respondents 63% felt remuneration for the work done was just enough or better. 15% did not respond leaving 22% who had concerns. Aside from pay levels, however, it was clear as in 2012, that participants were also strongly motivated by their enjoyment of the work they did, working outdoors and the camaraderie they felt working as part of close-knit teams. 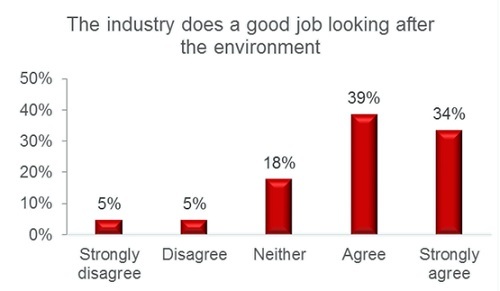 Participants also agreed or strongly agreed (73%) that the industry does a good job of looking after the environment while 76% felt that the industry provided sufficient direction to enable environmental protection. These results were similar to those in 2012. Mr Richards said the intention is to continue these surveys every three years in order to build a picture of how progress is being made in a range of areas that are important to the long-term social sustainability of the forest industry workforce.